We love to label others, pigeonhole them. As if doing so defines who that person is in a succinct sentence, or even just one word. I’ve noticed this lately in my own life in one particular area. As I meet people that have stumbled upon my work or read my books, or seen me talk about simplicity, they assume I’m a ‘minimalist’. I’m not, or at least I don’t consider myself one in the purest sense. I’m not even sure there is a pure definition of what a minimalist really is. To be clear, I possess more than one outfit. I own more than one bowl. I consume. I own more stuff than fits neatly into one backpack. I own a TV (one only for the entire home which is pretty minimalist for most I guess these days). Minimalism has been a useful tool in my own journey to living my version of a simpler life. It’s a gateway to a more intentional life. That journey is mine to own. What I consider simple enough for my tastes may not go far enough for you. Or perhaps it’s too simple. That’s fine. We get to choose, or we should do at least, what our lives look like. I often write under the broad umbrella of simplicity because I believe in its power. I love minimalist design, sparse writing forms (haiku for example) and the idea of chipping away at the unessential in life, so we can make room for the essential. Simplicity, 80/20 and minimalist concepts have had a profound impact on my life and overall outlook in the last 8 years or so. I believe others can benefit from a similar exploration and experimentation with these concepts in their own lives, looking to simplify down to a point they are happy with. A point that improves the quality of their own lives. I have less clutter than I once did, I need less stuff than I once thought, I shop less for possessions than I have in the past but I’m not living monastically. Far from it. I still have a wardrobe full with clothes I feel good in, a few guitars, a few too many books and CDs (yes, I still have CDs). I wear more than just blacks and greys. Some of my clothes are branded. I love to travel for adventures with my wife. I can still be found buying and sampling coffee in a cafe I haven’t tried before. I’m okay with all of that because I own it. In an age where we all like to share images online and consume the stories of others, there can be a danger that we try to contort to a vision that isn’t really us at all. Minimalism has been a major trend for a number of years and grown in popularity for good reason, many of us are seeking something more meaningful in our lives. More stuff isn’t it. However, the concept is not new. In fact, it’s as old as man. But perhaps we’ve never needed it more. 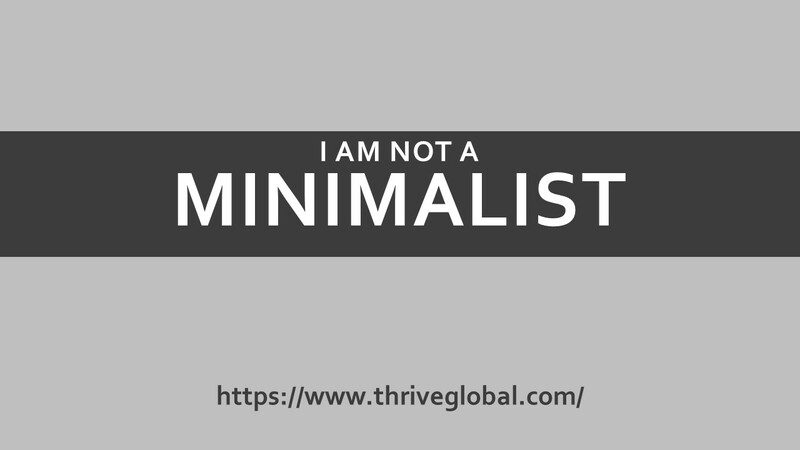 We can use minimalism as a tool without it taking over who we are. Without fear that we are not ‘minimalist enough’. We can use it to support us living more intentionally. We can consume less, waste less, stress less. Make more space for the things and people that matter most. We can do all of this without needing to share yet another online snap of an empty white shelf and hash-tagging it ‘minimalist’ or judging others for spending Saturdays at the shops. There’s quite enough of that already in the world. Minimalism is a part of my life but it doesn’t define my life. Maybe you’re the same.